This level and sloping property sits in a private homeowners association and features two bluestone patios. DARIEN — The unique colonial house at 35 Scofield Farms was about 13 years old when the current family purchased it. Nearly 20 years later, this now 33-year-old residence more closely resembles new construction with its many modern features and its melange of elegant and casual living spaces. This 12-room house, which was built in 1985, features spacious rooms with high ceilings, attractive moldings, a Christopher Peacock gourmet kitchen, and updated baths. It also has a floor plan that accommodates today’s lifestyle. 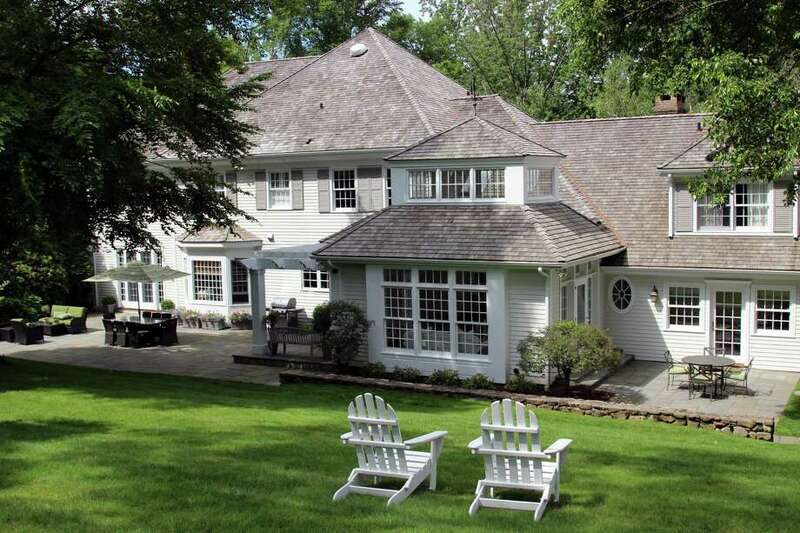 The white brick and clapboard house with gray shutters is beautifully sited on a 3.44-acre level and sloping property of professional landscaping which includes two bluestone patios, a fieldstone sitting wall, and an in-ground swimming pool. The arrangement of rooms at the rear of the house, their large windows, and several doors extend the living space to the outdoors and encourage entertaining in this space as well. Entertaining is made easy, not only with the open floor plan but with this home’s three wet bars and a wine cellar in the partially finished lower level. One of the homeowners, Pamela Wisinski, is a professional interior designer, and the fruits of her talent and labor are visible throughout the 5,666-square-foot house; so much so that several prospective buyers have inquired about purchasing this home complete with Wisinski’s furniture and home decor furnishings, an idea that the homeowners will entertain. They have loved living in this house and in this neighborhood, where they raised their three children. “It’s a fantastic family house,” Pamela Wisinski said. She especially loves the location of the house at the end of a cul-de-sac in the Allwood Association, a private residential enclave with a two-acre minimum zoning requirement. According to information provided by the listing agent, the Allwood Association is “the perfect setting for homeowners looking for a neighborhood feel.” Throughout the year, neighbors in this association get together for Halloween trick or treating, a summer barbecue, and this time of year for a holiday party. Residents also have a book club, ladies’ night, and other fun events. A weathervane depicting a golfer that sits atop the cupola above the sunroom serves as a reminder that this house not far from Wee Burn Country Club. It is also convenient to the high school, middle school, and Ox Ridge Elementary School, and is just minutes from downtown Darien. Inside, this house not only successfully blends elegant and casual spaces, but also offers a beautiful mix of traditional and modern spaces as created by the original architecture and enhanced further by Wisinski’s interior design touch. From the welcoming and sizable foyer step down into the formal living room, which is classically colonial with its coffered ceiling and fireplace, the mantel of which is decorated with dentil molding. That same finishing detail is found on the exterior facade of the house and in the crown molding of the formal dining room. This wing of the house also features a library with built-in cabinetry, bookcases, and one of the wet bars. The casual side of the home has a large breakfast room, sunroom, and family room off the kitchen, which features a teak center island with a breakfast bar for three, a farm sink, marble counters, a beverage center/wet bar with a beverage refrigerator and glass-front cabinets with interior lighting. High-end appliances include a Wolf six-burner range and Sub-Zero refrigerator. In the family room there is a red brick fireplace flanked by built-in cabinetry, a coffered ceiling, and skylights. The breakfast room features a built-in desk area, perfect as a home command space. The sunroom has doors on opposing walls to the patios. On the second floor there are five bedrooms and a loft study with a wall of built-ins. The master suite features a fireplace, two large walk-in closets, and a brand new bath with Carrara marble flooring, soaking tub, double vanity with milk glass counter, shower, and water closet. The lower level has a large playroom, game room, bar and the wine cellar. For more information or to make an appointment to see the house contact Holly Hurd of Houlihan Lawrence at 203-434-4201or HHurd@houlihanlawrence.com.